Parabiosis is a unique mix of occult industrial, cyber breaks, glitched idm and dark experimental electronic music, a glimpse at a futuristic dystopian world of cybernetic control and decaying reality. Parabiosis swells with a futuristic undertow, dishing out well-placed metallic lashings of cinematic synth sounds and heavily programmed, cut-up drumstorms that combine in fits of chaos and technical wizardry, unleashed in varying degrees of wrathe. The album is dark, conceptually cyber occult, and well-crafted, with Fate Æffect’s exceptional production abilities safely delivering us from start to finish. 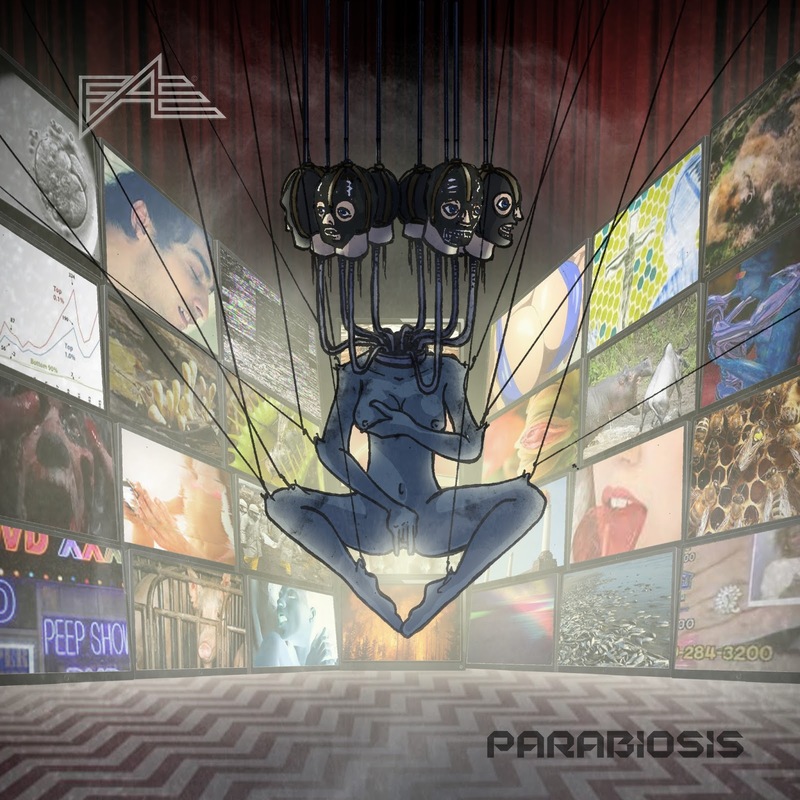 An album that will put you out of your comfort zone, the rough futuristic soundscapes of Parabiosis seep in with blasts of complexity and overwhelming tenacity. Like a Siren on treacherous rocks, unceremoniously followed by the inevitably brutal impact, Parabiosis morphs, lures, persists, destroys and deliberates on a surreal, creeping paranoia. 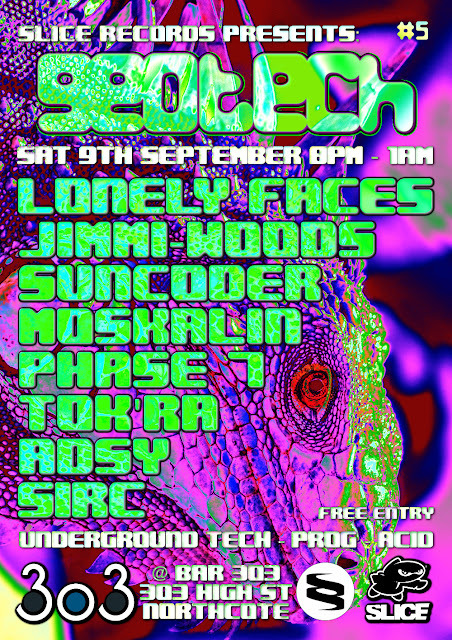 Slice Records presents: Geotech #5. These nights are about getting people together and for everyone to enjoy tunes from local, quality producers and DJ's in the comfy surrounds of Bar 303! 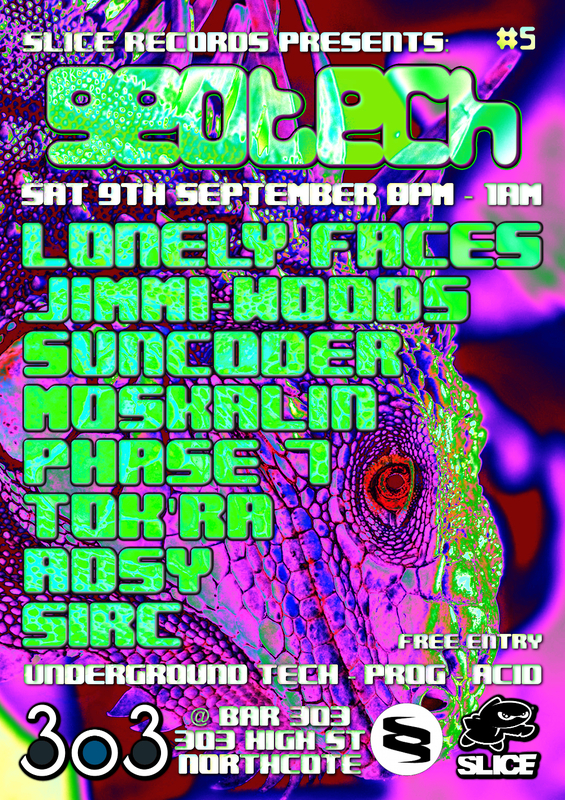 FREE ENTRY - CHEAP DRINKS - LAID BACK! 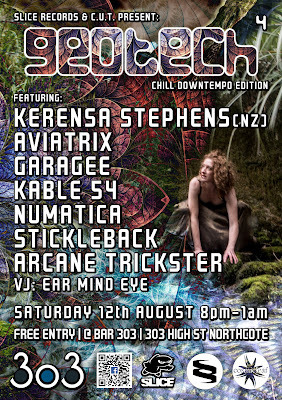 Slice Records, Tempest Recordings & Cosmicleaf Records present: Geotech #4 - Chill Downtempo Edition. 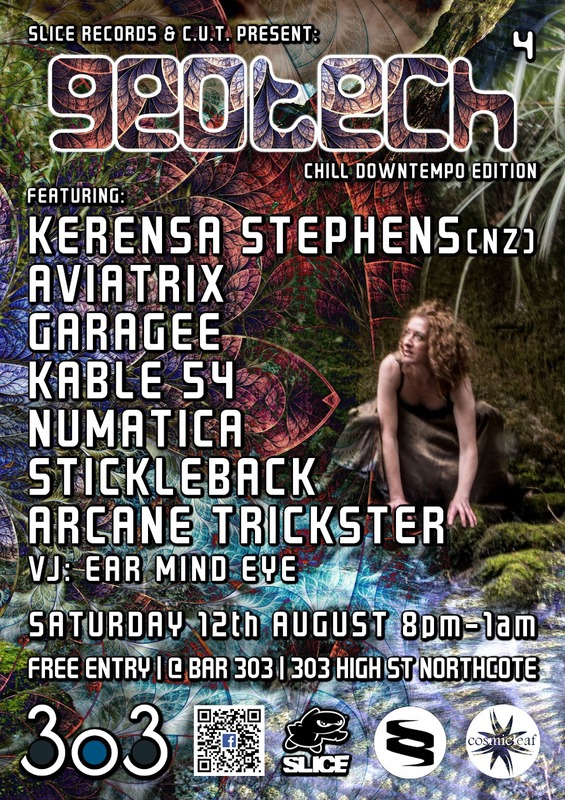 Escape the droll and the cold and come chill with some fine downtempo, chill, psybient and psydub in the comfy warm surrounds of Bar 303, featuring very special guest and headlining act Kerensa Stephens - Aviatrix from New Zealand along with a great lineup of quality local producers and musicians. Date/Time: Saturday August 12th, 7pm - 1am. Location: Bar 303, 303 High Street, Northcote, VIC, AUS.